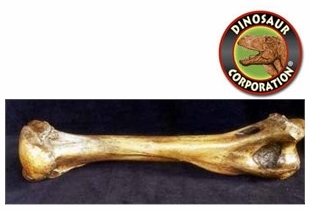 American Lion humerus replica is cast from original specimen. Panthera leo atrox. HUMERUS. Blancan Pleistocene, 100,000 years ago. American Falls, Idaho. The American lion (Panthera leo atrox or P. atrox) � also known as the North American lion, Naegele�s giant jaguar or American cave lion � is an extinct lion of the family Felidae, endemic to North America and northwestern South America during the Pleistocene epoch (0.34 million to 11,000 years ago), existing for about 0.33 million years. It has been shown by genetic analysis to be a sister lineage to the Eurasian cave lion (Panthera leo spelaea or P. spelaea). The American lion is one of the largest types of cat ever to have existed, slightly larger than the early Middle Pleistocene primitive cave lion, P. leo fossilis and about 25% larger than the modern African lion. The American lion is an extinct animal that originated in North America and is believed to have colonized northwestern South America as part of the Great American Interchange.